Well, winter is here! As I was cleaning up after the near blizzard like conditions it got me thinking about posting a quick article (or more) on winter survival techniques. 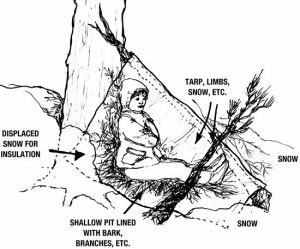 Over the years I have taught many a ninja and bBoy scout how to build and sleep in a survival shelter in the dead of winter. Not too long ago I was camping out in my Hammock tent at zero degrees and some of my scouts were in a survival shelter doing the same. Anyway I thought it would be good to give you two basic shelters that can be built quickly and with a tarp to help you survive in harsh conditions. Now the first s on a fallen log or something for one wall but this one is kid of a wrap around a tree . The first thing I would recommend is getting yourself some type of insulating material on the ground as you will loose a ton of body heat as you warm the frozen ground. 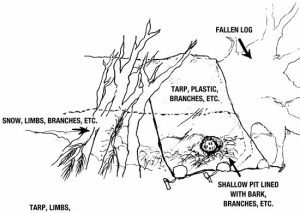 Grab leaves, pine needles, rags, newspaper etc and line the bottom of your shelter, then climb in out of the wind to warm up! I will dig up a few actual photos of shelters I have slept in to test my knowledge and preparedness, but for now absorb the information and get ready to try it out by sleeping out in the cold this winter!